Bars. Well, most of us have a favourite joint where you love to hang out alone or with friends, converse and meet new people. My local hangout is a pretty cool bar with a strange name, Forty Thieves, right in the middle of the picturesque Diani Beach. A bar that was recently ranked 17th Best Classic Bar of the world. There are many reasons to love Forty Thieves but nothing beats digging your toes into soft white sands and sipping on a cold one as you watch the ocean do it’s back and forth. It could cure schizophrenia. However, this is not about Forty Thieves as I have found another – albeit 50km away from Diani Beach, that could divert my affection. The Moorings. 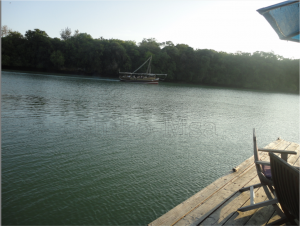 Located 15Kms North of Mombasa at Mtwapa facing the Mtwapa creek, its a splendid site where you can down some cold lagers as the sun sets with sweet oldies from the 70s, 60s and 50s. 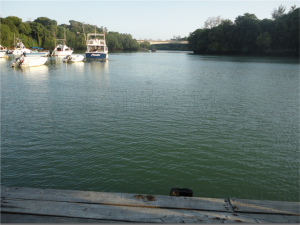 I love oldies and I heard a few of my favourite songs at The Moorings that I feel compelled to share. Do you wanna know a secret – Listen, Do you want to know a secret? Do you promise not to tell? Whoa, oh oh!. Let me whisper in your ear – Beatles (1963). So what is the big secret? Moorings is a floating bar. 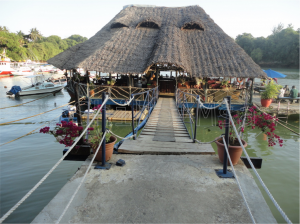 Its a marooned and floating structure and is one of the friendliest bars I have walked into in a long long time. Everything about it is warm and friendly. I’m into something good. Woke up this mornin’ feelin’ fine. There’s somethin’ special on my mind Herman Hermits (1964). The structure is all wood – an octagon-ish shape with a thatched roof. Nothing spectacular if you’re looking at it from afar, but once you walk in you’ll be impressed by the nicely polished all wood bar. The browns of the wood blend in quite nicely and the bar is mostly stack, save for the seats and tables, leaving you with only one choice – to enjoy the view. Oh! The sun beats down and melts the tar up the roof, and your shoes get so hot you wish your tired feet were fire-proof, under the boardwalk down by the sea – The Drifters (1964). Well, hanging near/around boardwalks was cool in the 1960s and it is to this day. But wait a minute, on a boardwoak with some cold beers would be better. Well, the bar has an enclosed part and 2 uncovered rafts attached to its side where you can dine and wine and still feel like you’re on a boardwalk. 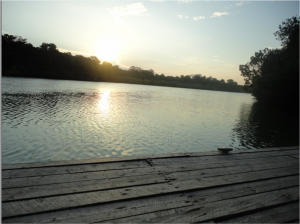 You can dangle your feet or flag for a boat and take a ride into the sunset. How cool is that? We got all the time in the world – Louis Armstrong (1956). The Moorings is calm and peaceful that time truly seems to stand still. Nightfall doesn’t feel like a time to leave and make the 50km journey back home, it feels like time to order another delicious pizza from the clay oven and sit back. All this time the bar is rocking gently to the waves, just like a boat would. 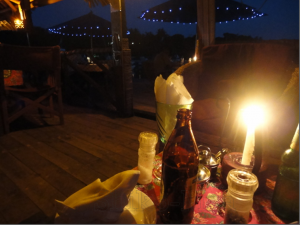 The warm ambiance,the chatter of the revelers and occasionally the sounds of the ocean makes it hard to leave The Moorings at 11.00pm I think. Oh! how fast time flies! This entry was posted in General and tagged forty thieves bar. Bookmark the permalink.